Quick. Simple. Effective. Qwikpic, The industry’s first ATM track App, makes capturing and preserving site condition data a breeze. Staying up to date on site conditions is problematic with inconsistent processes and data capture from your technicians in the field. Months later it becomes unclear who went where and what they found on location. QwikPic makes keeping tabs and staying in compliance a seamless and efficient process for capturing and preserving site visit information and visual records that can easily be recalled and reported months later. Efficient, accurate ATM site condition tracking and reporting. The site survey can have up to 30 optional or mandatory questions; each question can be multiple choice, textual, or image based. Typical surveys take about 5 minutes to complete and when finished, are submitted to the QwikPic cloud database. If the smart phone is out of communications range, the survey submission will be queued till the phone is back in range where it will complete it's upload to the cloud. Finished surveys are stored in the cloud database making reports easily available to the QwikPic administrator. 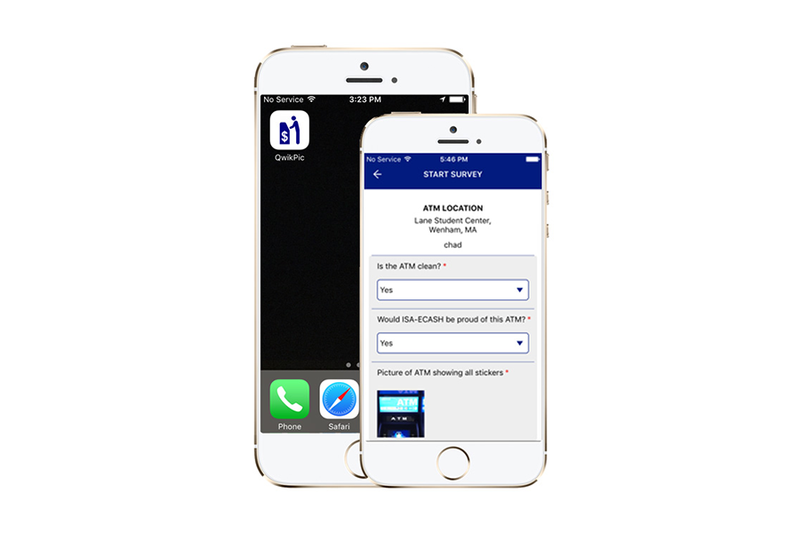 The QwicPic smart phone survey app does NOT have access to the QwicPic cloud database except to receive and submit the specific site info needed for each survey.